Post number two... finally. Sorry there's been a bit of a delay. The last few weeks have disappeared before my eyes. 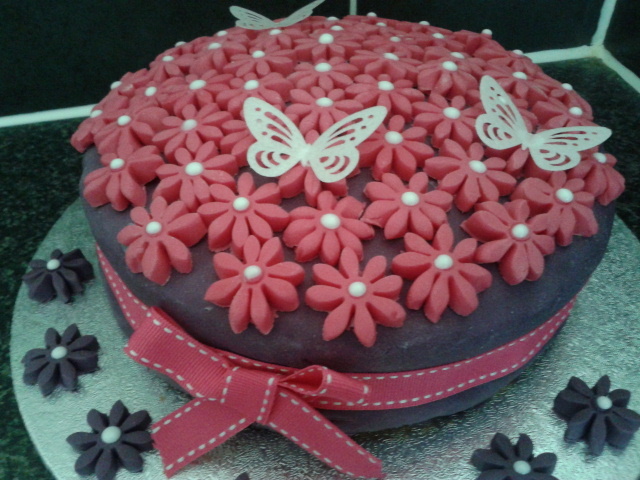 My latest bake was a classic birthday cake. Gorgeous vanilla sponge, sandwiched with lashings of buttercream filling and Mackays Strawberry Preserve with Champagne on top. 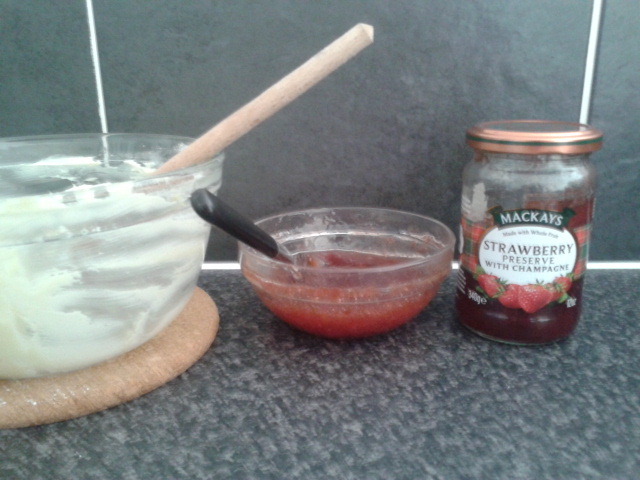 I also used this to glaze the cake before icing (heat for 20 secs in microwave and paste on with a pastry brush). I originally bough two 10in springform tins for my cakes, but discovered that with a small family, the cake ends up too big to be finished. I downsized to a couple of 8in loose bottomed tins purchased at Morrisons and they've so far delivered on all occasions. 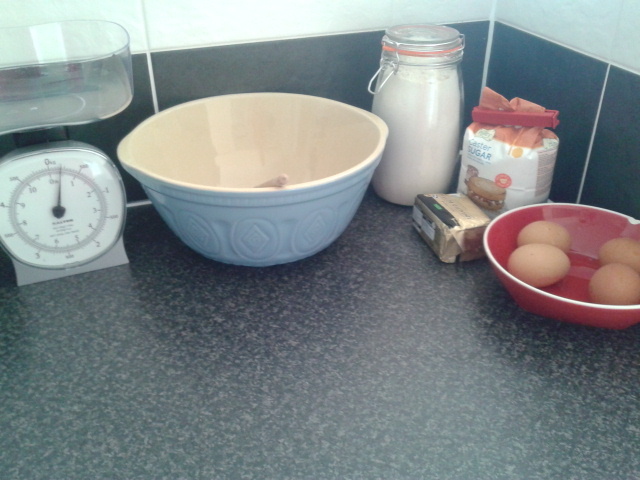 Getting the ingredients prepped before starting! I'd be lying if I said I used a family recipe handed through the generations. It's not. It's James Martin's Victoria Sponge recipe for BBC Good Food, which you can find here. I always make sure my cakes are properly cooled before I start to assemble them. Taking your time is key! I am a big fan of Renshaw coloured icing for my cakes. It's easy to work with and comes in so many amazing colours. I chose purple for my base colour. 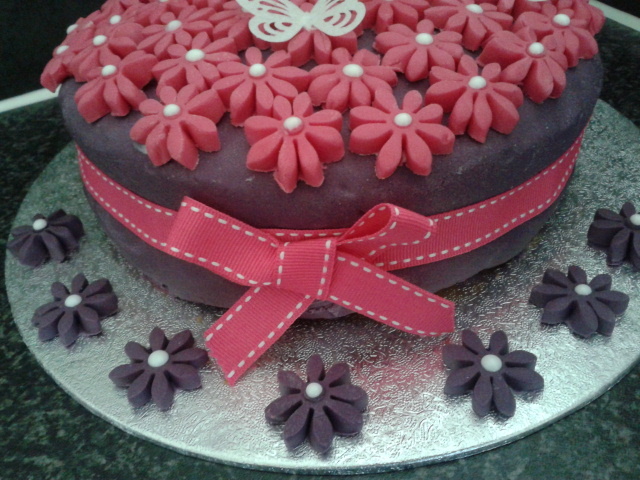 Rolled it out to fit the cake, trimmed, then finished with an icing polisher from Hobbycraft. These things are a godsend to get your nail marks and blemishes out of the icing! I also used a rotating icing turntable which is perfect for small cakes. It allows you to check everything is neat before trimming and check for any short pieces of icing. I kept the decoration simple. Purple all over, then used a daisy cutter, to cut out individual daisies from hot pink icing. 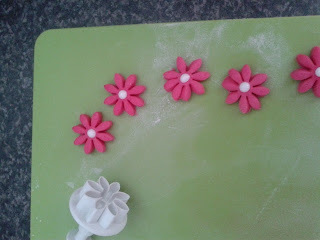 I used white gel icing to dot the middle of each daisy. 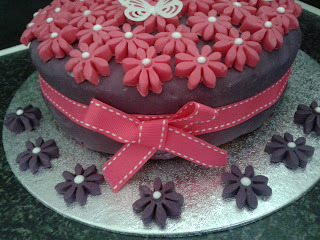 It may have taken over 3 hours to pull together, but I was delighted with the finished cake. Mr WhatClaireBaked's Mum was the recipient and couldn't quite believe I'd pulled off something like that home baking. I've learned though, if you're not gifted, keep designs simple. Use the tools that are available to make your life easier and don't be frightened to buy additional ready made decor for a really professional finish. Thanks Kat! New to the whole blogging thing. I've been baking at home for ages, so figured it was finally time to jump on the blogging bandwagon... Now to build my following!!! Thanks Vohn! Let the blogging challenge commence!